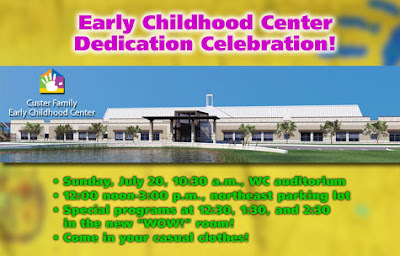 The Grace Brethren Church of Columbus, Ohio (Dave Plaster, pastor) will dedicate its new Custer Family Early Childhood Center next Sunday, July 20, starting promptly at 10:30 a.m. in the WC auditorium. All are invited to come in casual clothes and join Operation Barnabas students from across the U.S. as they lead the celebration service including a ribbon-cutting ceremony with Pastor Jim Custer and family. Festivities continue noon-3 p.m. when all may tour the new facility and enjoy rides, games, food, and more. More information is available at www.gracebrethren.org.